This is my go-to oatmeal cookie recipe... They stay so soft and chewy after being baked, and they won't last long...trust me. You can eat them plain or stuff them full of buttercream like I did today.. they're delicious either way! 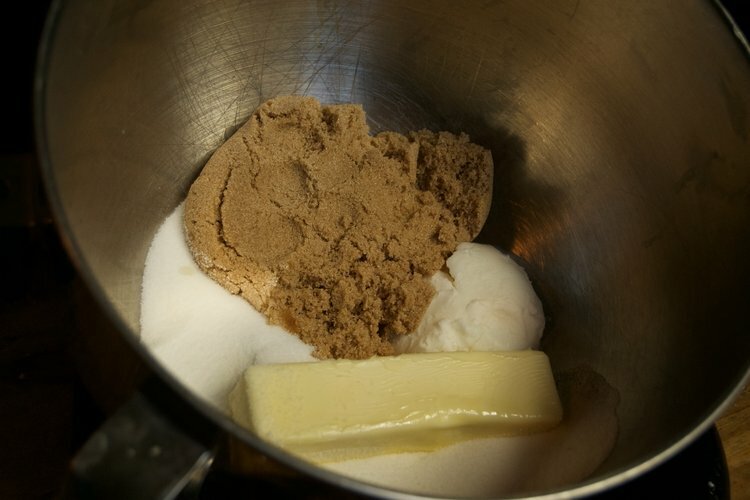 Preheat your oven to 325° F. First cream the butter, shortening, brown sugar, and granulated sugar. Once all of the ingredients are combined, and the mixture forms a paste, begin adding the eggs one at a time. It is important to wait until the first egg is completely mixed in before adding the second, and make sure to scrape the bowl after each addition to avoid unmixed ingredients getting stuck in the bottom of the bowl. In a separate bowl combine the flour, baking soda, salt, and baking powder. Add dry ingredients to the sugar mixture in two additions, mixing just until combined. Next, add the oats one cup at a time. Now is the time you can get creative; I decided to add mini chocolate chips to half of the dough to mix things up a little. The possibilities are really limitless, you can add mini chocolate chips (like i did), regular chocolate chips, m&ms, peanut butter chips.....and the list goes on and on. To scoop the cookies, I like to use a one tablespoon scoop because I think that the size is perfect for this cookie. Not so small that you're left feeling hungry, but also not so big that your stuck with a stomach ache after eating one! This cookie dough also freezes very well so I like to only bake what I need that day and scoop and freeze the rest so that I have an easy snack later. Bake the cookies in a preheated oven (325° F) for 14-16 minutes rotating halfway through. While the cookies are baking, you can prepare the buttercream. Start by creaming the butter, the softer and creamier it is, the better your end product will turn out. After the butter is well creamed add in the vanilla extract. Mix until combined. Begin adding the powdered sugar half a cup at a time. Do not add the next until the previous addition is completely mixed. Add salt. Once you have added the full one and a half cups, turn your mixer to high speed and whip for 5-7 minutes. The longer you whip, the lighter and softer the buttercream will be. Using a rubber spatula, place the buttercream in a piping bag (or ziplock) with a tip of your choice. I like using an Ateco #864 or #865 (buy one here) because I think the ridges look really nice one you sandwich the cookies together. Once you top the cookies with the buttercream, place another cookie on top to create the sandwich. I like to roll the edges of the cookies in more mini chocolate chips (mini things make everything better), but you can leave without or roll them in something else like sprinkles or crushed graham crackers.